← Have You Viewed a TED Ed Flipped Lesson? Sajed Kamel, the author of Renewable Revolution, will be giving the keynote, and Dave Chameides (www.chasingsustainability.org) is speaking at the end of the day. In additional to participants, we are looking for volunteers to lead workshops on what works in teaching environmental awareness and greening our schools. Please email (rschildge@gmail.com) if you are willing to present. We have a limit on the number of presentations, and there is a cap of 100 attendees at the conference, so sign up soon. There is also an early-bird discount on the registration fee, which covers the cost of lunch. 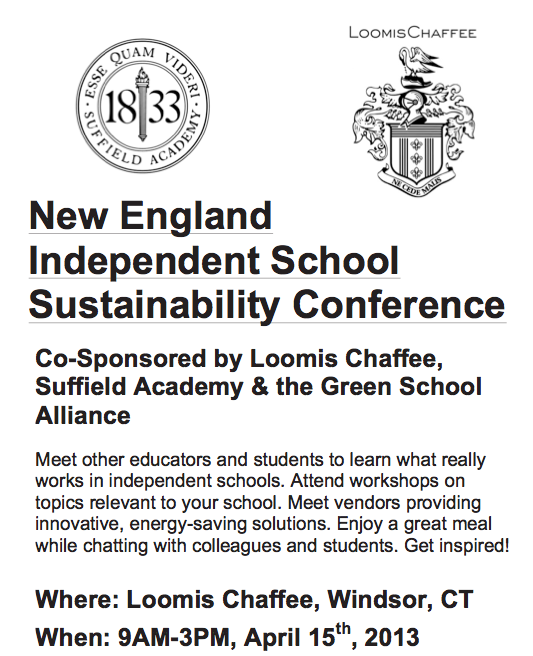 This entry was posted in Across the Curriculum, Sustainability and tagged Green School Alliance. Bookmark the permalink.